Well, crap. I can’t remember why I made this. Maybe it was Lord of the Rings Risk night at Star & Simon’s. I make variations of this all the time, so I can’t remember what exactly is in it. Maybe fake chicken sautéed with bell peppers and onions with a layer of refried beans in there somewhere. Kind of like a Mexican lasagna with tortillas instead of pasta. Oh yeah, and everything is better with tater tots, right? The sauce is the Doña Maria mole sauce that I’ve written about before. Kroger is now carrying it. W00t! This Doña Maria ready-to-use mole sauce was a favorite to keep on hand for quick meals. It disappeared for a while but it finally showed up again at Buford Highway Farmer’s Market. 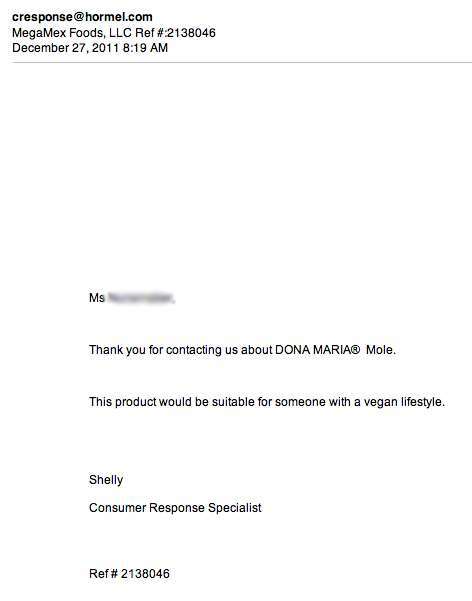 Full disclosure: I have not contacted the company to check if the “natural ingredients” are indeed vegan. Maybe I should actually do that…anyway. (Update below post) Last time I posted about it, we ate it in the form of an enchilada stack. 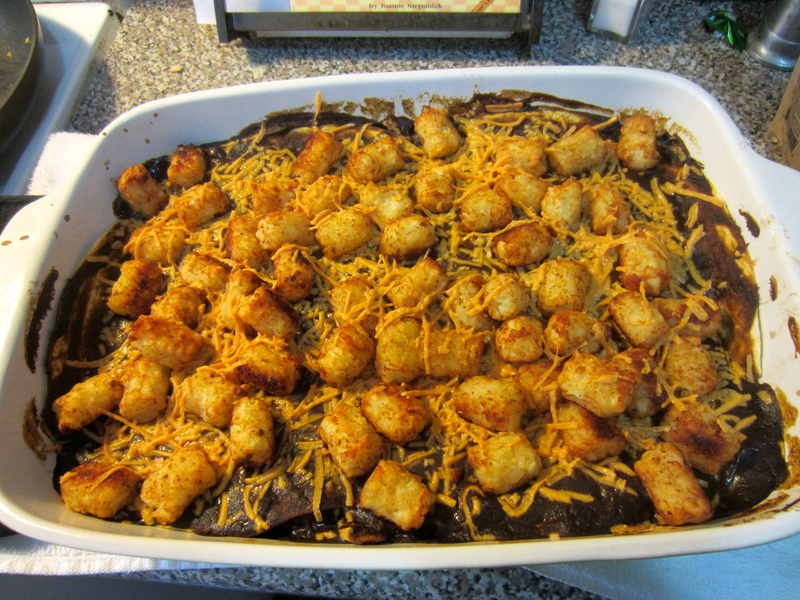 This time, I rolled up Trader Joe’s fake chicken strips fried up with onions and garlic and Daiya in flour tortillas, stuck them in a square pan, dumped the mole sauce all over then sprinkled with Daiya. Baked it for around 25 minutes at 350F and it was food. 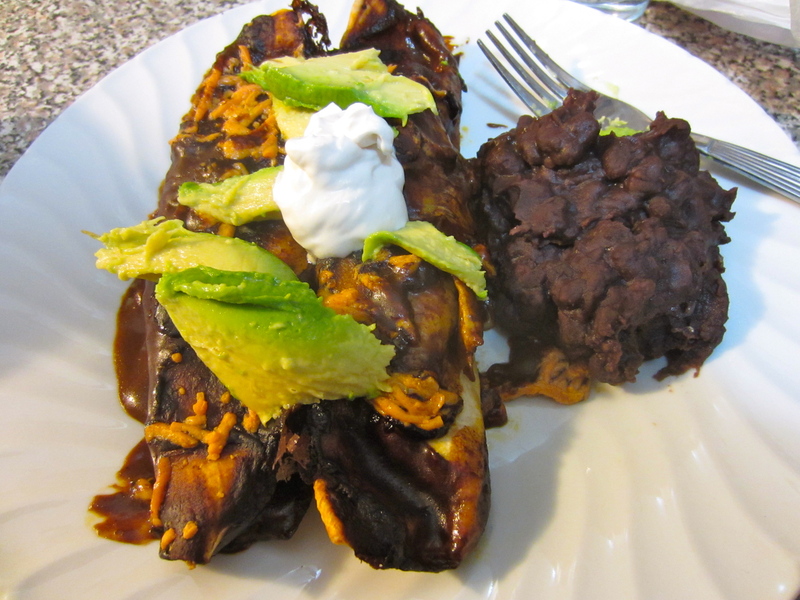 To keep all the food mud colored, we had it with a side of refried black beans, from a can all lazy like. Spray a medium casserole pan with cooking spray. Preheat oven to 350 degrees F.
Heat oil in a large sauté pan. Once warm, toss in the onion and bell pepper. Sauté until onion starts to soften, about 2-3 minutes. Add garlic and seitan. Sauté for another minute or two. Add squash and corn, sauté another few minutes until onion is translucent and squash is softened. Season with salt & pepper and remove from heat. Spread a small amount of the prepared mole sauce on bottom of casserole. Lay down two corn tortillas. Spoon 1/3 of the vegetable mixture on top of the tortillas, spread a spoon or two of mole sauce on top of that. Now do the same with two more layers ending up with two tortillas on top. Pour remaining mole sauce all over the top completely coating the tortillas. Sprinkle top with cheese. Bake about 25-30 minutes or until cheese is melted. If necessary, broil for a minute or so to melt cheese.